The Pompey History Society looks back on what was making the Sports Mail headlines on February 23, 1985. 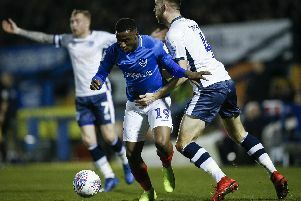 Kevin Dillon scored two penalties as Pompey demolished struggling Oldham Athletic, watched by 11,108 at Fratton Park. Dillon scored from the spot in the 28th minute after Vince Hilaire was brought down. And when Alan Biley was fouled eight minutes later, the midfielder converted his second penalty of the afternoon. Biley headed in Hilaire’s cross a minute before half-time, before the Latics pulled a goal back on 57 minutes when Colin Henry scored the game’s third spot-kick. Biley’s header from another Hilaire centre restored Pompey’s three-goal lead on 63 minutes, and Hilaire netted Pompey’s fifth, flashing home a 15-yard shot with seven minutes left. Pompey: Alan Knight, Ivan Golac, Paul Hardyman, Bobby Doyle, Noel Blake, Billy Gilbert, Neil Webb, Kevin Dillon, Dave Bamber, Alan Biley, Vince Hilaire. Oldham: Andy Goram, John Bowden, Willie Donachie, Darren McDonough, Gary Hoolickin, Mick McGuire, Mark Ward, Colin Henry, Brendan O’Callaghan, Bob Colville, Andy Barlow (Kenny Clements). Everton’s 2-1 win at Leicester kept the Toffees at the top of Division One. Second-placed Tottenham Hotspur won 1-0 away to West Bromwich Albion, while Manchester United, in third position, secured a single-goal victory against Arsenal at Highbury. Southampton lost 2-0 away to Nottingham Forest, with Steve Hodge and Peter Davenport the goalscorers for Brian Clough’s side. In the top-of-the-table Division Two clash at Ewood Park, Oxford United led Blackburn at half-time thanks to a fourth-minute header by Kevin Brock. The home side drew level after the break through Jimmy Quinn. Injury-hit Brighton suffered a blow to their promotion chances as they were beaten 2-0 by Manchester City at Maine Road. Division Three leaders Bradford City were hammered 4-0 by Millwall at The Den. The result moved the Lions up to third in the table. Bury beat Northampton Town 3-1 at Gigg Lane to stay five points clear of Blackpool at the top of Division Four. QPR midfield player Gary Micklewhite joined Third Division Derby County for £90,000. AFC Bournemouth crashed to a 3-0 defeat at home to Reading. Meanwhile, in Division Four, Aldershot lost 2-1 to Scunthorpe United at The Recreation Ground. In the Southern League, Fareham lost 2-1 to Shepshed at Cams Alders, with Simon Long scoring for the home side. A sparkling second-half performance gave Portsmouth a confident-looking win over Winchester in the Hampshire Senior Merit table at Rugby Camp. The score ended 33-15 points.